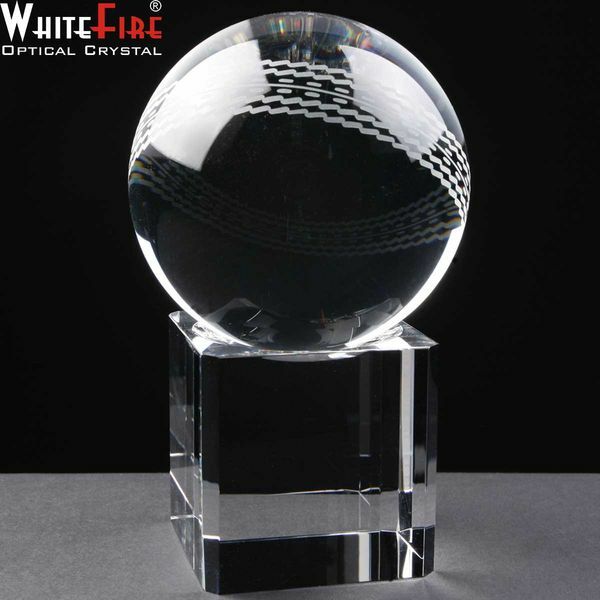 This optical crystal whitefire cricket ball on base is makes a superb gift or award for any cricket presentation, and is supplied in a blue, velvet lined casket. The price includes the cricket ball being personalised with up to 50 characters engraved for free. Any additional characters are then charged at 25p each, and there is also an additional cost for a logo or your own design. The 3" cricket ball with base is approximately 3" wide by 3" deep by 5" high, and has an engraving area of approximately 1.5" by 1.75" for personalising for your cricket event or presentation. This cricket award is also available in a larger (4") size. We do not usually keep this cricket award in stock, so please contact us before ordering to ensure we can supply it in time for your presentation. The optical crystal whitefire cricket ball is postage band B.